Consider joining The Pesticide Stewardship Alliance. It’s a great way to stay connected with your colleagues and meet in dynamic interactive forums to examine issues and solve problems. The membership cycle is September 1, 2018 – August 31, 2019. Click here to fill out the membership form and become a member today. Known as A Lifecycle Partnership for Pesticide Management, TPSA brings together a wide range of companies, associations, public agencies, institutions, and individuals dedicated to pesticide stewardship. Their stewardship activities include formulating and/or distributing pesticides across dealer networks, educating farmers and other pesticide end-users to promote full life-cycle stewardship, collecting triple-rinsed pesticide containers for recycling, and collecting and disposing of unwanted chemicals by licensed hazardous waste haulers. providing convenient, nonadversarial forums where public, private, nonprofit, and international interests can meet informally to discuss issues of mutual concern. 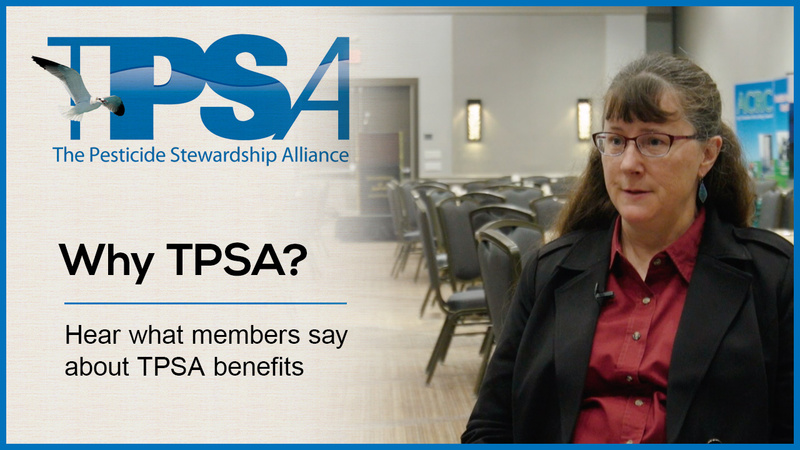 TPSA is a member-driven organization. Members are encouraged to get involved as time and interests allow. This not only helps decrease operating costs but assures a lively, diverse, and democratic organization. Because communication and coordination are at the core of TPSA’s activities, substantial effort is put into the annual work conference. Electronic communication is another major tool. The web site hosts archives of conferences, papers, research and links to related resources along with administrative information. The annual conference is the work session for the organization-sharing successes and discussing notable issues, projects, and needs related to pesticide stewardship. Organizations with members attending these conferences include the Agricultural Container Recycling Council (ACRC), CropLife America, CropLife Canada, CropLife International, the Environmental Protection Agency (EPA), the American Association of Pesticide Safety Educators (AAPSE), the American Association of Pesticide Control Officials (AAPCO), the Agricultural Retailers Association (ARA), the National Pest Management Association (NPMA), and the North American Hazardous Materials Management Association, (NAHMMA), along with hazardous waste haulers, managers of pesticide collection and container recycling programs, and various state and local government agencies and universities. Members have the opportunity to get involved in the administrative and policy functions of the organization through our committees, projects, and the Board. Members can access added features of the organization website. Members who register for TPSA conferences pay a reduced fee. Perhaps the biggest benefit of all is simply being part of an organization that promotes and facilitates stewardship activities throughout the pesticide life cycle. TPSA projects to date include label reform work, a U.S. pesticide disposal program status assessment, support of a partnership to plan and carry out pesticide collection and disposal events, and a “life cycle” stewardship initiative. Members are able to directly engage colleagues from all over the nation and world via the organization website and by becoming involved in projects.